OLD SAYBROOK — Now in its 49th season,Chestnut Hill Concerts will present four programs of chamber music this August at the Katharine Hepburn Cultural Arts Center in Old Saybrook. The prestigious series is highly-regarded, not only for its programming, but also for the world-class musicians that artistic director Ronald Thomas invites for the performances. The concerts will take place August 3, 10, 17, and 24, all Friday evenings at 8 p.m. Cellist and artistic director Ronald Thomas will host and perform in each concert. The Aug. 3 concert features Ronald Thomas performing the 5th Bach Cello Suite. The remainder of the concert presents John Novacek’s Rags for Violin and Piano, and the Brahms Piano Quartet in G minor, Op. 25. 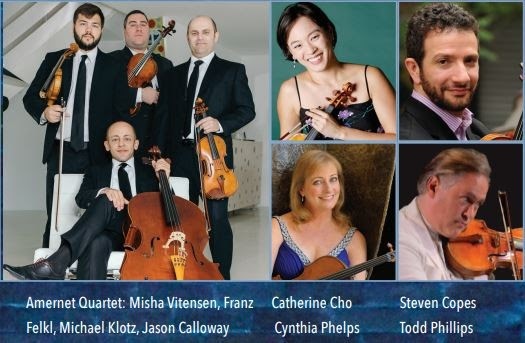 In addition to Ronald Thomas, artists include Steve Copes, violin; Matthew Sinno, viola; and Randall Hodgkinson, piano. The program on Aug. 17 presents music by Debussy, Kodály, and Dvořák. Ronald Thomas and Mihae Lee will perform Debussy’s Sonata for Cello and Piano; Catherine Cho, violin, Tien-Hsin Cindy Wu, violin, and Todd Phillips, viola will perform Kodály’s Serenade for Two Violins and Viola, Op. 12; and the ensemble will perform Dvořák’s Piano Quintet in A major, Op. 81. The season finale on Aug. 25 explores the music of Mozart, Mendelssohn, and Schumann, including the rarely-heard Horn Quintet in E-flat by Mozart, K. 407, written for one violin and two violas. The concert also includes Mendelssohn’s Piano Trio in D minor, Op. 49 and Schumann’s Piano Quartet in E-flat major, Op. 47. 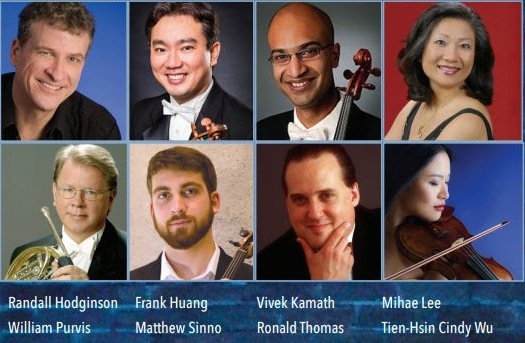 This performance introduces Frank Huang, concertmaster of the New York Philharmonic, to the Chestnut Hill audience, and brings back some of its favorite performers: William Purvis, horn; Tien-Hsin Cindy Wu, violin and viola, Cynthia Phelps, viola; Ronald Thomas, cello; and Mihae Lee, piano. The 2018 season of Chestnut Hill Concerts is made possible with support from the Connecticut DECD Office of the Arts. All concerts are Friday nights at 8 p.m. at the Katharine Hepburn Cultural Arts Center (The Kate), 300 Main Street in Old Saybrook, Connecticut. Subscriptions to the four concerts are $140 (orchestra) and $120 (balcony). Single tickets are $40 for orchestra seats and $35 for the balcony. Kids and teens come free. To purchase tickets, contact The Kate’s box office at 860-510-0453, or visit www.thekate.org.